As a child I remember ice cream being quite a simple affair - usually a weekly treat of a vanilla cone from the ice cream truck. A really special treat was going to the cinema and having a choc ice. 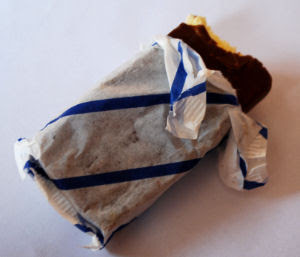 I remember the anticipation of that ... tearing off the wrapper carefully so as not to break the chocolate coating and then crunching through it to get to the creamy vanilla ice cream. Today of course ice cream is much more sophisticated. We have American ice cream, French ice cream and of course Italian gelato ice cream. Commercial ice cream makers add to this with their offerings of 'chunky' ice cream, ice creams named after celebrities, etc. Then there's homemade ice cream which is a world in itself. Well, I have often wondered how many other fans of the simple choc ice might be out there when I was stopped in my tracks the other day by a music video my son was playing. It was Sir Elton John's "I'm Still Standing" - a great song with the music video filmed in Cannes and Nice in the South of France back in 1983. About halfway into the track there is a quick flash of a clapperboard in front of the camera; I couldn't quite make out what it said so I naturally wanted to check it out. I went back to the clapperboard and paused the video .... what did it say? Nice one Sir Elton ... at least I know I'm not alone in my thinking!